The Wireless Router is a small, low-cost, wireless device that is primarily deployed to provide wireless coverage in large geographic areas, campuses or in-building applications. It enables non-line-of-sight communications between Clients and Intelligent Access Points (IAP), in a Mesh 6300 network. Wireless Routers are typically used to seed new network deployments to ensure sufficient coverage while the client population is growing. The MWR6300 extends coverage and connectivity in a 2.4 GHz Mesh network by meshing access points and users together. Mesh Wireless Routers (MWR) enable robust, non-line-of-sight communications between users and the network. Mesh Wireless Routers also act as reference points for position location of users and vehicles within the 2.4 GHz Mesh network. 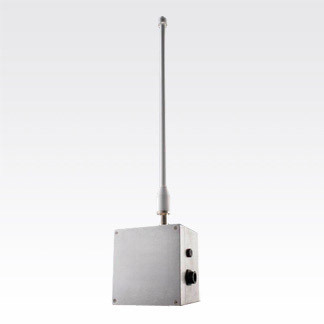 The MWR6300 requires only power to operate, as data is transmitted 100% wirelessly between nodes. Wireless Routers use the same transceiver technology developed for our Wireless Modem Cards (WMC6300). This creates a compact, low-cost solution for range extension and non-line-of-sight operation. Wireless Routers are designed to mount on utility poles, billboards, buildings, etc. Simple mounting hardware and a plug-in power connection speeds deployment. They automatically power up and integrate into the network, requiring no manual provisioning or configuration. Mesh Wireless Routers intelligently balance traffic between client demand and network resources. Clients are routed around local congestion, while Multi-Hopping technology enables capacity from distant access points to be "moved" to exactly where it is needed. Network resource utilization is continually optimized, reducing network and operational expenses. As one part of the MEA solution, Mesh Wireless Routers transparently support end-to-end, standards-based Internet Protocol (IP) applications and devices. This maximizes existing investments in client hardware and software, while eliminating training for new applications or procedures.